Hotel accommodation of today consists of tiny box rooms with minimalist décor. Brands that celebrate and pride themselves on consistency and uniformity. Signature Living hotel stands out loud and proud above the rest. No two rooms across the entire Signature Living family are alike which is why we pride ourselves on outstanding décor and individuality. From our group of fabulously unique Liverpool hotel rooms, we have selected our top 10 suites and apartments. We hope you agree with our choices. 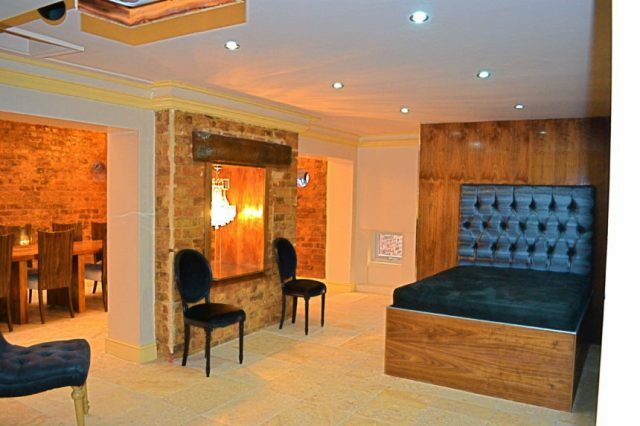 This one of a kind Liverpool hotel room has facilities usually seen in the swankiest hotels in Vegas. No other hotel suite in Liverpool boasts its own in room mosaic pool spanning 25 feet along the centre of the lower floor. This amazing feature provides guests with the most unforgettable pool party they’ve ever attended. Along with your own private pool guests can also enjoy the private bar and built-in multimedia surround sound music system with a huge drop down cinema screen. Consider the LP room your own private club for the evening. Sleeping 24 guests in utter comfort and luxury across two floors. Each plush double bed is nestled into an individual wood paneled alcove. Each alcove has it’s own LCD TV, that descends from the ceiling and a small but perfectly formed en suite. There ain’t no party like LP Pool party with Signature Living hotel. If you like to indulge in a little decadence from time to time, step into Signature Living’s Haig room to enjoy the ultimate in indulgent Liverpool accommodation. Enter the room through opulent antique doors into an interior furnished with plush royal blue velvet and gilded ornate mirrors. Another Signature Living hotel style staple are the bronzed Chesterfield bedsteads which will make you feel like utter royalty during your stay with Signature Living. Once inside you are greeted with shimmering gold and wooden walls. The small niches ready to be stocked with bottles of your favourite pre-ordered tipple. 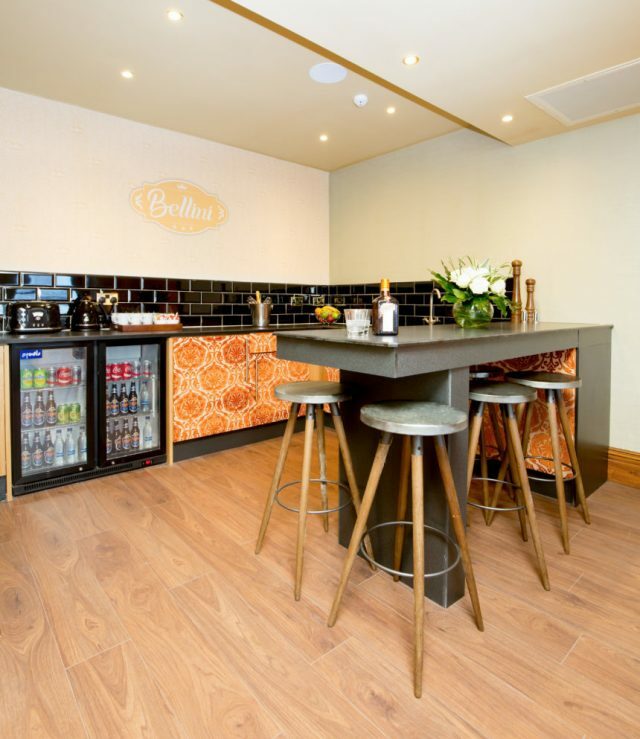 You and your guests can also enjoy the ease of having your very own kitchenette and bar area. Perfect for some pre-night out drinks or a night in with your group. The ultimate highlight to the Haig room is the bathroom, a perfect place for pampering. 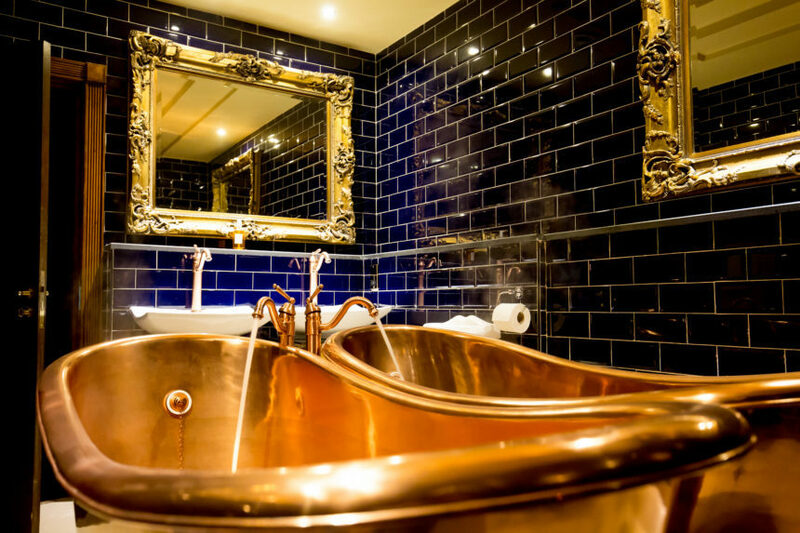 Let yourself melt into one of the two huge free standing copper clad bathtubs. Bringing the words “over indulgence” new meaning, the Haig room at Signature Living hotel is a must for your trip to Liverpool. Named after that delicious champagne cocktail, Signature Living’s Bellini suite definitely delivers the fizz to any stay in Liverpool. Steeping into Bellini is like taking a dip into a flute of fizz, complimented by a dash of sweet peach liqueur. For a touch of added glitz and glamour the en-suite bathroom provides each of the nine guests a chance relax amongst the bubbles in a huge double Jacuzzi bath. Furthermore, the Bellini room also comes complete with multimedia facilities for music or movies and a fully functioning kitchenette and bar space. Mix up your own batch of champagne cocktails and live like VIP in Signature Living’s Bellini suite. Who doesn’t equate Smirnoff vodka with a great night out. Signature Living have gone a step further and associated the crisps coolness of Smirnoff vodka with the décor and theme of their Smirnoff suite. Sleeping up to six guests the Smirnoff room is furnished in a crisp clean silver theme. The décor set to mimic a bottle fresh from the freezer. The frost like furnishings include silver crushed velvet bedding, chrome painted headboards and a sleek and silvery kitchenette. Signature Living have provided all you need for a great party stay with a large LCD TV, and multimedia music system. As Smirnoff says, “don’t wait for an extraordinary night, make your own” with a stay in Signature Living’s Smirnoff suite. Forget pushing the boat out, Signature Living have pushed the boat through the keyhole and into Wonderland. An entire floor of Ultimate Signature Living apartments awaits when you step into Wonderland, and the floors namesake apartment is out of this world. A trick to the senses is the huge ceiling mounted mirror that reflects the entire suite and gives a topsy turvy feeling to your room. The rest of Wonderland is complimented by quirky little features such as rabbit pillows and tea pot lights. You half expect to see the Cheshire Cat curled up on your Chesterfield sofa. Signature Living’s signature style provides a grand en-suite bathroom which comes complete with a lush double Jacuzzi bath. An ideal and one of a kind quirky apartment, the most wondrous example of Liverpool accommodation inspired by Lewis Caroll’s timeless novel Alice in Wonderland. We all know what wardrobe envy feels like and trust us we have taken the phrase to a whole other level. Enter Signature Living’s Wardrobe and prepare to be blown away. This room comes complete with its own private dining space. Ideal for entertaining a large group of guests from the comfort of your most luxurious Liverpool hotel room. Let the grandeur of the Wardrobe room envelop you as you enjoy each other’s company reclining on the huge double beds or gathered around the eight-seater dining table. The Wardrobe room is an amazing addition to the Wonderland floor and provides guests with the ultimate luxury during their stay in Liverpool. Perhaps the most popular Signature Living property is the original Vault on Bold Street and it’s not difficult to see why. The sleeping space can accommodate up to 30 guests with even more space to hold a superb private party, The Vault has become synonymous with Signature Living in Liverpool. Stretched across the basement level floor of what used to be a bank, The Vault still has an original safe that works. One of the highlights of the apartment is that the safe can be filled with goodies such as spirits, mixers and a variety of party favours to make any night memorable. 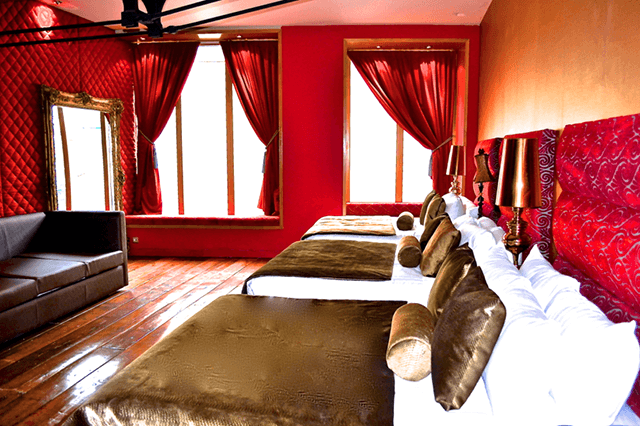 There are three huge bedrooms all equipped with comfy double beds and a dark a decadent décor. Each room has an en suite bathroom with a wet room style shower and the first bedroom contains the number one feature of the vault itself. Throughout The Vault there are a number of multimedia facilities, each room having its own LCD TV. The main room and living space is equipped with a sound system that major night clubs would envy and a drop-down cinema size projector screen. 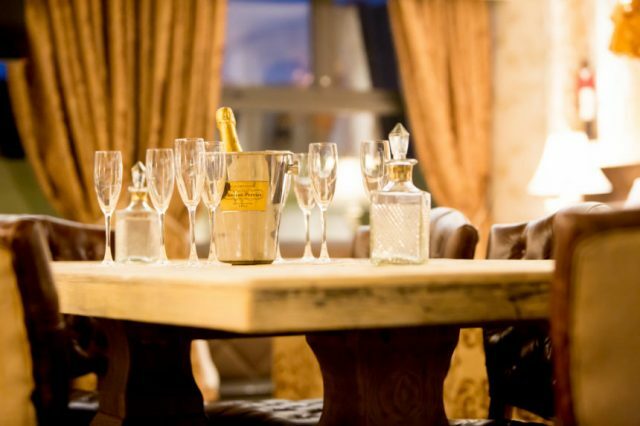 Along with all the home comforts of a fully functioning kitchen, The Vault is Signature Living’s number one choice for a group stay in Liverpool like no other. Located on the top floor of Signature Living’s Bold street apartments you will find The New York Penthouse. A fabulous space that spans across two floors and provides guests with an ideal location to access all of Liverpool’s best nightclubs and bars. 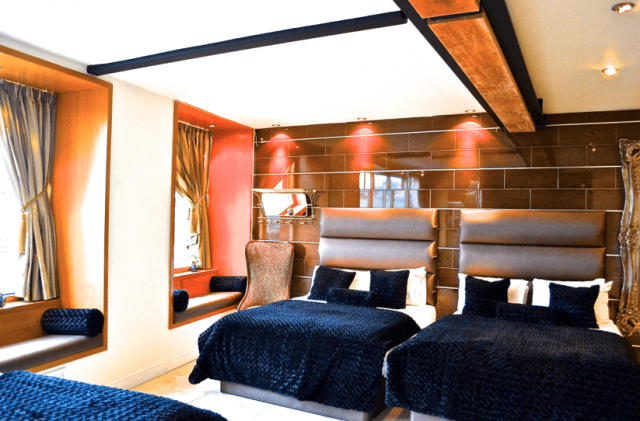 The New York Penthouse has a highly cosmopolitan feel which, coupled with the location, offer guests the best way to enjoy their time in Liverpool. There are a number of separate sleeping areas and stylish en suite bathrooms. Of course enjoy the signature double Jacuzzi bath, for a touch of added glamour. Furthermore, the apartment can sleep a group of 16 and has kitchen facilities to make each guests stay as comfortable as possible. The New York Penthouse is the ideal place to start and end a party in Liverpool with Signature Living. Inspired themes are the key to what makes Signature Living unique. Usually centred around popular culture, the themes make for most intriguing city centre stays. None more so than the Burlesque floor at Signature Living Hotel on Stanley Street. It’s here that Signature Living have created their most clever concept for Liverpool accommodation by combining four separate suites into one huge party apartment. The Burlesque floor has a vibrant and seductive décor, in deepest shades of rouge and ornate gold. Each corner suite of the floor has its own en suite bathroom, some equipped with double Jacuzzi’s and others with mosaic wet room showers. Multimedia facilities are available throughout the floor as well as several LCD TV’s gaming consoles and DVD players. Catering perfectly to a group of hens out in Liverpool, the Burlesque floor can accommodate a party of guests as large as 26. So, let your party be inspired by the theme and bring along your feather boa for stay on the Burlesque floor with Signature Living. One of the most well-loved films of 2009 is responsible for the theme of the last of our top 10. 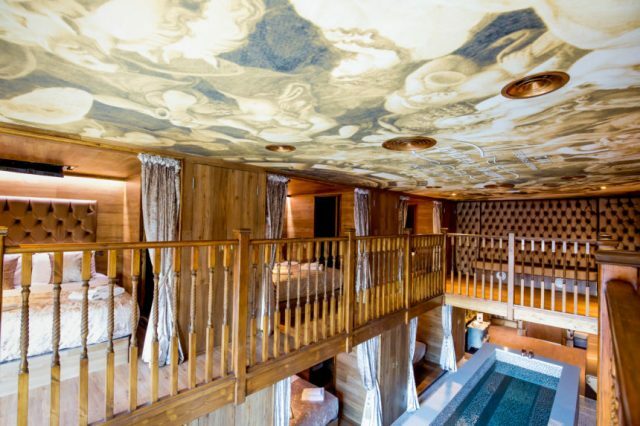 The Hangover suite is one of the most sought after suites in the Signature Living Hotel. This is down to the layout and décor of the room. Down a long corridor on the top floor of the Signature Living Hotel you enter any one of two separate suites. 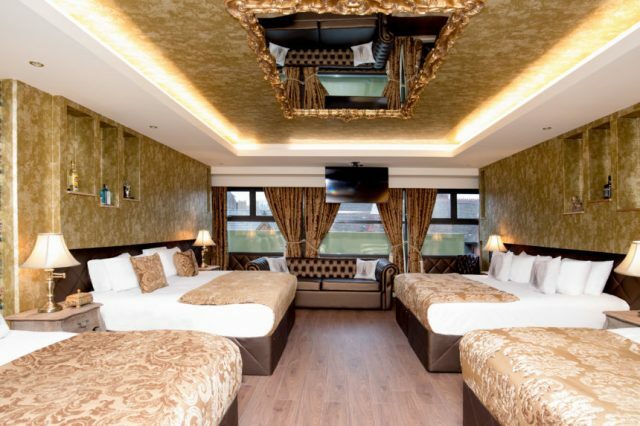 On one side, you’ll find three plush double beds and a huge comfy sofa. Around the next corner is a bathroom you will never want to leave. The glossed black Jacuzzi bath and mosaic wet room shower glistens inviting you to come in and relax. This side of the suite is also home to the fully functional kitchen, great for cooking up a midnight feast or mixing up some pre-party drinks. Just across the hall in the second suite are another two double beds and yet another en suite bathroom. 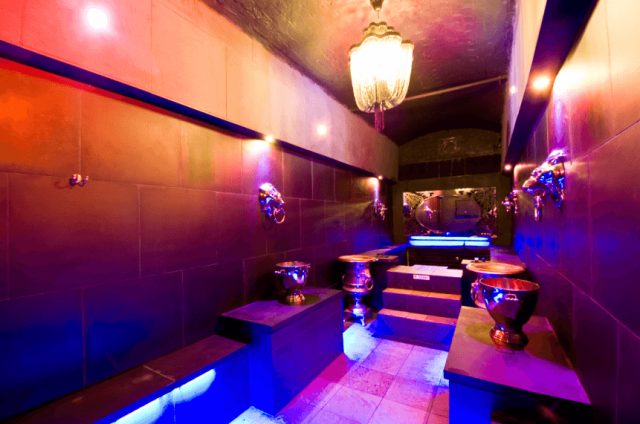 This time you and a friend can recline into deep roman style baths separated with a quirky champagne ice bucket. Pop a bottle on ice and kick back in the bubbles. There we have it a list of the top 10 Signature Living rooms, and all their best features. Book your stay in these or any of our other top quality Liverpool hotel rooms for your next celebration or group get together. 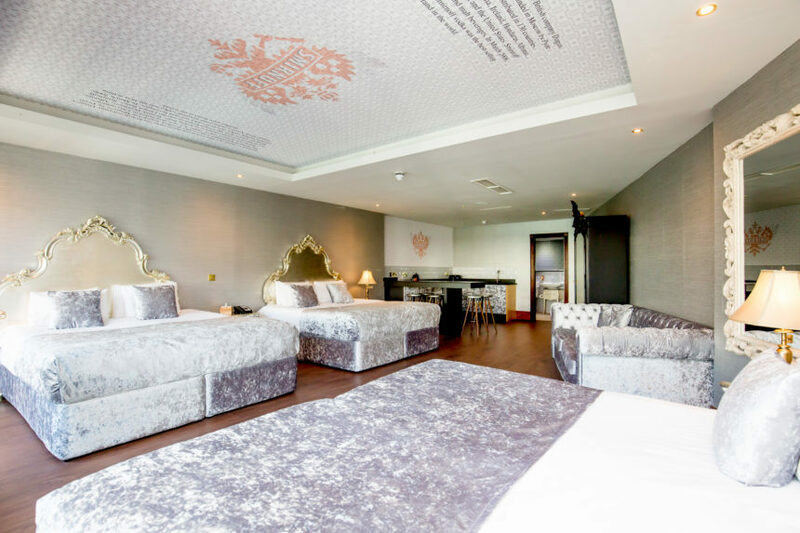 Call our helpful reservations team on 0151 236 0166 or email info@signatureliving.co.uk for more information on any of the rooms listed above.